We all know the value of a healthy lifestyle, and we know that regular exercise promotes good mental health. And indoor exercise bikes, whether upright or recumbant, can play an important role in staying healthy and losing weight. The problem that many people face in attempting to maintain a regular exercise fitness routine is staying motivated. But staying motivated to maintain your exercise regime will never be a problem again with our Scotland Cycling Scenery DVDs! "Dear Sirs: Awesome product! I own a Spin studio and just used the video for my true road cyclist (Orange County Bicycle Club) and they we're floored by the wonderful technigues used to record. We have been watching crappy vids in basements for years and this was a delight to watch alone and a great ride when added to our Spin room 50 plasma and my music. Thanks I have purchased all 4 bike vids and await new releases. Mike, Cycle Fitness Center"
"Not sure if I mentioned this or not but I LOVE your DVD’s. They inspire me everyday to get on the spinner. When I first began my quest roughly six months ago my health was not something to brag about. I had a heart attack a day before my 46th birthday and luckily very little damaged was done. After jumping on the health band wagon I have lost a significant amount of weight. My cholesterol is 160 and I am off all my meds except the aspirin that I take every morning. I couldn’t have done it with you and your innovative product. You made a difference in my life as well as my wife and two small children. Thank you and god bless!! Frank"
"I am so hooked, your DVD's are wonderful. I want to order 4 more. Shelley"
"I already have all the DVDs that you currently offer! I am anxiously waiting for new ones. I love your DVDs, they are the best! Is there a way you could perhaps e-mail me when the new ones come out? I will bookmark your site. Thanks Again, Virginia"
"Thank you very much! We already have all the other DVDs that you have produced and enjoy them immensely. We will definitely enjoy these, and look forward to your new ones. You must have a great time filming them! We certainly enjoy and appreciate your efforts. All the best, Robert"
"Just thought I'd let you know that the DVDs arrived on May 8th. They are great! I can't wait for the Scotland one. Thanks! I'll be ordering again. Email you soon. Sincerely, L.J.C." "What a wonderful idea! I lived in Europe for 32 years and now I am stateside. Your videos brought back so many memories that photos just can't do. Thank you, Margaret"
November 4, 2008 - Our newest Virtual Experience DVD is certainly one of our most beautiful! The views from the one-lane road that clings to the shore of Loch Etive, Scotland are nearly picture-perfect, framed by the spring flowers in full bloom. So it's an easy prediction that this Virtual Jog and Bike Ride DVD is destined to be one of our best sellers. Kathi spends hours researching unique lodgings for our trips abroad and once again she booked an exquisite, scenic location. She chose the spectacular Blarcreen House Bed and Breakfast as our base for filming during our stay in the Scottish Highlands. Landing in Edinburgh, we picked up our rental car and drove for three hours to the Scottish Highlands. I don't expect I'll ever become "comfortable" driving on the "left" side of the road - Kathi's role is to constantly remind me to "Stay on the left - stay on the left." Upon our arrival to Blarcreen House, our hosts met us and made Kathi and me feel welcome in their stately Victorian mansion. In the ensuing days, two things became clear: our hosts genuinely enjoyed their interaction with their guests and did everything in their power to make our stay enjoyable. If you ever travel to the Oban, Scotland area, we highly recommend Blarcreen House. The port of Oban is an interesting little resort town known as "The Gateway to the Isles." We found several wonderful restaurants here and returned several times for late dinners. In between times, I had to sample the local Fish and Chips - which I found to be delicious! Oban confirmed something that, in our opinion, was a disturbing trend; in many of the Scottish cities we visited, large old stone churches had been deconsecrated and converted to tourist info centers or other purposes. We wondered why the church appeared to be losing members? 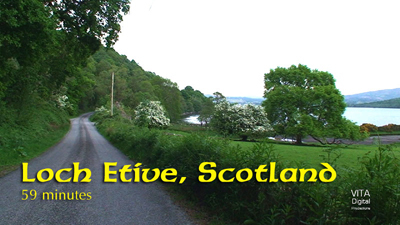 We set aside one day to travel northward to the small village of Glencoe. This little settlement, the site of the infamous Massacre of Glencoe was an important chapter in Scotland's history and crucial to my mother's ancestors. So it was absolutely necessary that I visit this historic site, the land where my mother's ancestors had once lived. I was familiar with the basic facts of the Massacre: that on the 13th of February in 1692, the King's soldiers, after accepting the hospitality of the MacDonald family for several weeks, arose early in the morning and began simultaneously killing all MacDonalds in three settlements along the glen — Invercoe, Inverrigan, and Achacon — although the killing took place all over the glen as fleeing MacDonalds were pursued. Thirty-eight MacDonalds from the Clan MacDonald of Glencoe were killed by the guests who had accepted their hospitality, on the grounds that the MacDonalds had not been prompt in pledging allegiance to the new monarchs, William of Orange and his wife Mary II. Another forty women and children died of exposure after their homes were burned, although some did escape to the cold Highlands. It is a sad chapter in Scottish history. Can you imagine the sense of history that enveloped me as I stood there in that idyllic village? That was just one of many memorable moments in our spring visit to Scotland. I can't wait to go back and explore this beautiful country even more. Copyright © 2018 VITA Digital Productions. All Rights Reserved. Designed by CSS Templates.